Long-Term Election Observer Reflects on Being Part of Nepal "Roaming Team"
Home News & Events Real Lives, Real Change Peace Long-Term Election Observer Reflects on Being Part of Nepal "Roaming Team"
Jason Katz is a long-term observer (LTO) for the Carter Center's election observation mission in Nepal. Katz previously worked at the National Democratic Institute for International Affairs in Washington, D.C., and served as an election monitor during both rounds of elections in Peru in 2001. Unlike other LTOs, I am not stationed in a particular region, although my base city is Kathmandu. My British colleague, John Clayton; our Nepali interpreter, Kamal Adhikari; and myself form what is internally labeled as the roaming team, or as I jokingly tell others, "Carter's Special Forces." Due to Nepal's mountainous terrain and limited road infrastructure, most of our observation work is done on foot. Our aim has been to reach the country's most remote and politically sensitive areas to make the Carter Center's observation mission as inclusive and widespread as physically possible. This is not to say that the other teams are not doing the same in their regions, but rather we do this full-time. We collaborate with all teams to identify areas that are little known, hard to reach, or deemed as sensitive. In these last six months working as a LTO in Nepal, I have trekked some 600 miles and my team likely broke the world record for highest electoral observation work at an altitude of 5,500 meters, with Mt. Everest towering above us. In fact, President Carter traveled to the exact same location in 1985, as we later discovered, so perhaps we can share the credit. As an LTO working for The Carter Center, I am almost always well-received by the people I meet, including representatives from all political parties. Most have expressed gratitude and appreciation for the work we are doing, and this makes me feel that our work is valuable. Our first trip in the field was to a sensitive district that was formerly a Maoist stronghold. The lodge where we stayed, after an exhausting marathon trek in the rain, was also run by the Maoists. Early the next morning, two former Maoist soldiers, who were now members of the Maoist political party, invited themselves into our room and proceeded to talk to us. As they had woken us up, we were left with little option but to welcome them and begin a meeting right then and there in bed. Americans such as myself have not exactly been favored by the Maoists for many reasons. However, their suspicions of us being spies soon dissipated as we explained what we were doing and provided them with credentials and letters of invitation from different political parties, including the Maoist leadership. We later arranged to continue the meeting in a more formal setting with additional party members at their office. That evening, one of the men from the morning meeting joined my team partner and me for a cup of tea. The mood was pleasant, and the three-hour-long conversation was fascinating. Over the course of the evening, several more villagers sat at the table. One pulled out a journal with messages from people who had passed through the region in previous years. He asked if I would write down my impressions of Nepal, which I did, but in the mindset of an observer working for The Carter Center. After finishing with the piece, I retired for the evening. So eager was he to learn what I had written that he asked our interpreter to translate it right away. I had written about my role as an observer in Nepal and of the Carter Center's commitment to peace and human rights. That day I also had spoken with many people of the Magar ethnic group and even learned a few words in their language. Impressed by the Magars, I decided to add how "cool" I thought they were in a postscript in my journal piece. While brushing my teeth, I heard a roar of laughter coming from the dining area down the hall. I was later told by my interpreter that the bit on the Magars was the part they liked best. Nepal has a long history of caste discrimination and ethnic division, and the constitutional assembly election is currently the country's greatest opportunity to start addressing these issues. During our conversation that evening, we were both impressed with the commitment each had toward the organizations we represent. But more importantly as people, we had the ability to connect with one another and establish an environment of trust and openness regardless of our nationality, ethnic background, or political affiliation. I think I speak on behalf of all LTOs who have shared similar experiences. 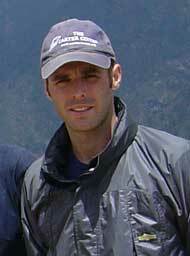 Jason Katz, long-term observer for the Carter Center's election observation mission in Nepal.